Tomorrow marks a year older for Bo's Coffee. As a celebration, they will be giving back to their costumers through Bo's Coffee 15 and 50 Promo. 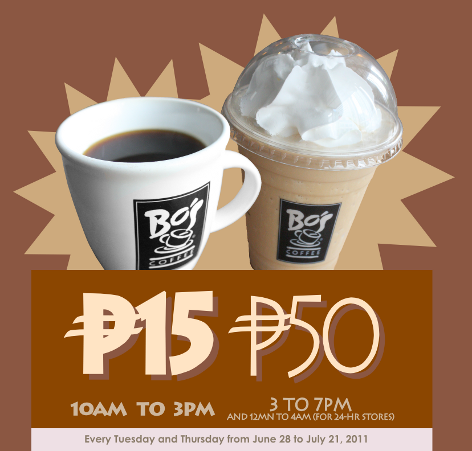 Fifteen years ago, Bo's Coffee opened their first door in the Philippines at the Ayala Center Cebu. That time, the Filipinos didn't understand much on why a cup of coffee can cost more that it does now. Fast-forward to 2011, the Filipinos find the cost of coffees in shops reasonable. This is because of the experience they get while enjoying their cup. On the same day of the anniversary, Bo's Coffee will be opening their 50th branch in the country and they are hoping to open more. Like it was first sold, Bo's Coffee will be selling selected beverages at Php15.00 and Php50.00-denoting 15 years of coffee experience and 50 new branches. Sizes other than the ones enumerated above will be sold at the usual price. A customer may order a maximum of two (2) items under this promo in one transaction. This mechanic is made so the shop could serve everybody. This promo is not valid in conjunction with other promos. This promo is applicable to all Bo's Coffee branches nationwide except for stores in airports (NAIA1, NAIA3, Cebu Mactan). A cup of coffee is no longer understood by Filipinos as a drink to make oneself awake early in the morning but a drink to make the day. Don't miss this promo! I am not a fan of Bo's Coffee but I joined their promo. I hope they'll extend it. LOL!